Victoria’ s hit music station is getting a makeover. 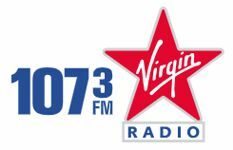 iHeartRadio Canada announced Friday the launch of 107.3 Virgin Radio in B.C.’s Capital. For Chris, it’s a return to the place he grew up. Along with playing today’s most current music, Virgin Mornings with Brittany and Chris will feature music, trending news and exclusive prizes – including the highly popular Phrase That Pays contest, where listeners can instantly win $500 and tickets to some of the hottest concerts in B.C. NOTE: Brittany is ‘moonlighting’ as the weather voice and face of CTV Vancouver Island News. Congrats Brittany & Chris! Looking forward to tuning in! That explains why Chris’s voice was absent from middays this week on Virgin Vancouver. I remember meeting Brittany back in the Fall of 2009, when she was anchoring the morning show on Powell River’s Sun FM (I was there as an athlete ambassador for a Vancouver 2010 pre-Olympic event). I was impressed by her hard work and deddication to the community. Congrats to the new team! Why, why, why compete against KiSS who are in the bottom of the basement? Would it not make more sense to go after the Q, or even the Zone? What is that saying about putting lipstick on a pig? oh well…..